This Unique foot massager features both soft and hard flexible bristles that clean and massage your feet whilst circulating blood stimulation. The Foot Cleaner and Massager is ideal for people with limited movement and makes cleaning your feet in the shower hassle free! This means no more bending down in the shower to wash those dirty soles. The Built-in genuine pumice stone works a treat to rid hard skin from your soles leaving with you with soft clean feet every time! Strong slip proof suction cups on the underside of the mat allow you to fix the massager to the shower floor with ease. So you can clean your soles and enjoy a comfortable foot massage every time you hop in the shower! 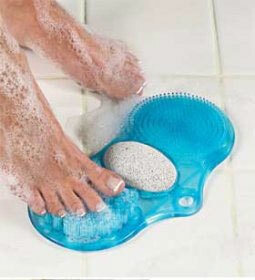 - Makes washing your feet in the shower a breeze!